In 2004 Sanjaya Baru left a successful career as chief editor of the Financial Express to join Prime Minister Manmohan Singh as his media adviser in UPA 1. Sanjaya Baru, a journalist, was Dr Singh's media advisor during his first term as PM between 2004 and 2008. In his book, The Accidental Prime Minister - The Making and Unmaking of Manmohan Singh, he reportedly quotes Dr Singh as having told him that there cannot be two centres of power. "That creates confusion. I have to accept that the party president is the centre of power. The government is answerable to the party," the PM told him, according to the 301-page book, published by Penguin. Singh had been toying with the idea of appointing his principal economic adviser C Rangarajan, "the comrade with whom he had battled the balance of payments crisis of 1991-92", as finance minister, according to the book. In book Dr. Baru writes that after Manmohan Singh had led the Congress party to electoral victory in 2009, Dr Singh had made "the cardinal mistake of imagining the victory was his". He may have convinced himself that his performance and destiny had again made him the PM, and not Sonia. "Bit by bit, in the space of a few weeks he was defanged. He thought he could induct the ministers he wanted into his team. Sonia nipped that hope in the bud by offering the finance portfolio to Pranab (Mukherjee), without even consulting him,"
Mr. Baru claims that Sonia Gandhi decided key appointments to the Cabinet and to the PMO. Baru has written that Singh was "defanged" by the Congress in his second term with Sonia Gandhi deciding on key appointments to the Cabinet and to the PMO, as he seemed to "surrender" to her and to the allies. According to him, Sonia's "renunciation" of power was more a political tactic than higher calling or to an "inner voice" as she put it in June, 2004 after she chose not to take up the post of prime minister despite leading the Congress to electoral success. "But, while power was delegated, authority was not," he writes, citing the instance of her unsuccessful effort to appoint a retired Tamilian official as Principal Secretary to the PM and to place her trusted aide Pulok Chatterjee in the PMO. The retired official had worked with Rajiv Gandhi but had declined Sonia's invitation. Such appointments were aimed at ensuring a degree of control over the government in addition to the Congress president having a decisive say in the allocation of portfolios. Pulok, who was inducted into the Manmohan Singh PMO at the behest of Sonia Gandhi, had regular, almost daily, meetings with Sonia at which he was said to brief her on the key policy issues of the day and seek her instructions on important files to be cleared by the PM. Indeed, Pulok was the single most important point of regular contact between the PM and Sonia. He was also the PMO's main point of contact with the National Advisory Council (NAC), a high-profile advisory body chaired by Sonia Gandhi. Manmohan Singh was himself incorruptible, and also ensured that no one in his immediate family ever did anything wrong, but he did not feel answerable for the misdemeanours of his colleagues and subordinates. In this instance, he felt even less because he was not the political authority that had appointed them to these ministerial positions. In practice, this meant that he turned a blind eye to the misdeeds of his ministers. 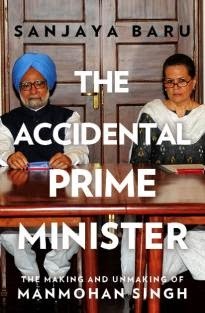 The Accidental Prime Minister is Baru’s account of what it was like to ‘manage’ public opinion for Singh while giving us a riveting look at Indian politics as it happened behind the scenes. As Singh’s spin doctor and trusted aide for four years, Baru observed up close Singh’s often troubled relations with his ministers, his cautious equation with Sonia Gandhi and how he handled the big crises from managing the Left to pushing through the nuclear deal. In this book he tells all and draws for the first time a revelatory picture of what it was like for Singh to work in a government that had two centres of power. Baru cites the creation of the National Advisory Council (NAC), headed by her, in 2004 as the first sign that Sonia's renunciation of power was a political tactic. It had created a parallel policy structure. Singh had realised that he had no option but to live with it although it seemed that "he was not too comfortable" with it. What's so new about all this? It was tactics because the king-maker can enjoy power and prestige where as king will remain a puppet.And dynasty has amassed in bulk what they want.